The beast was old, and looked it. His skin was tight and mottled across his scalp, his eyes sunken. He walked slowly now, his voice was a tired, quiet wheeze. But when those sunken eyes fixed on you, when that tired voice addressed you, his power was evident. You got the feeling that Death had decided this one was too much work. There is no violence, no depredation, no evil those eyes haven’t seen. The Beast was far beyond judging actions against any standard but personal gain. He had lived long enough and successfully enough, the rules by which he lived clearly worked. But it was time for a change. He was tired, he was sick of living the kind of life where every moment was a possibility for everything to come down around him. And he was tired of hurting others, surprisingly. Inasmuch as he had ever thought of himself as the kind of person who has a soul, he felt that his was getting tired. So now, having come down a convoluted path, he was a philanthropist It’s not a hard thing to be when you have far more money than you could ever use, far more money rolling in every day than you could ever spend. He suspected that giving some of it away would help him feel like a better person. At the very least people would think better of him when he died. Ha. Like he was going to die anytime soon. But it was just about time to disappear. Presently Davis Brown, the Beast’s CFO, arrived and knocked on the door of the Beast’s current office. He didn’t call his employer “The Beast”, of course. At least, not to his face. He called him Mr. Danwill. And it was Mr Danwill that he had come to visit, deep below the Luxor, where the Beast was currently renting space. The office doors were huge, wooden affairs, tasteful and sedate and incredibly thick. Davis Brown stood quietly outside those doors until they swung inwards silently. The Beast’s desk stood in a pool of light, probably in the center of the space, but who could say? There was no other light outside the bright oblong around the huge desk that seemed to be built of the same wood as the doors. Behind it stood a tall leather chair of an old style, worn but cared for. There was a slight rustling sound in the dark beyond the desk, and the Beast approached, wearing a tan suit and a white shirt that was unbuttoned at the throat. He sat in his chair and waited for Davis to be seated. “Yes, well?” The Beast said, his fingertips pressed together in front of him. Davis knew better than to waste his employer’s time. “Your hospital is ready to be built. I got the budget from the contractors, and it’s well below the amount you told me. We have clearance from the city and the county. The groundbreaking ceremony will be scheduled in a few days, but will probably not happen until June. I’ll inform your secretary. I have a copy of the press release if you want to look it over.” He slid the paper across the desk. The Beast glanced over it cursorily and pushed it away. “Yeah yeah it’s fine, sure.” He said, getting impatient already. The Beast was cunning, clever, and capable of almost endless focus when he was interested in something. When he was bored, however, he got petulant and fidgety like a small child. “Who was the informant?” Suddenly the Beast was all focus, intent and hard-eyed. There was a hollow crash behind Davis and the huge doors to the Beast’s office were thrown back. Between them stood a massive man, fully seven feet tall. His huge, curly black beard was covered in dirt and he wore what looked like a prison uniform, but torn and covered in dirt. “Her name is Liz. Black girl, crazy colored hair. Thinks she’s an angel.” The intruder growled. “Yeah, they always do,” the Beast said quietly. His face betrayed no surprise or shock at this monster’s entrance. “Excuse me, who are you? How did you get in here?” the huge man ignored Davis and walked up to the desk and leaned on it. “We’ve got problems, Youngster.” He said to the Beast. Then he turned his eyes to Davis. Davis closed the door and stood outside it for a moment, collecting his thoughts. And he could have sworn he heard a sound like rasping scales coming through the door. That’s Dana. She’s my night nurse, and I’m glad to see her. I’ve only been here three days, and she’s been my overnight nurse for the last two. She’s way nicer than the first one. “Oh, the usual. Kids had a big day, lots of school stuff. It’s almost restful coming here for a while.” She laughs. Dana laughs a lot, actually. She seems like she’s just happy all the time. She’s in her late twenties, blond, with blue dyed tips, hair down about mid back. She’s got green eyes and kinda ruddy skin. She’s married, has two kids. I know more about her than I do about some of my friends at work. But being in a hospital is kind of a special situation. And then the worst part is over and she starts putting my medications in my IV, conscientiously beeping each one and beeping my bracelet to make sure I’m getting the right drugs and that my insurance is getting billed for them. And while she does this we talk. There aren’t many lies in hospitals. Some of the talk is very clinical, discussing the state of my digestive system after the surgery and how and where I’m hurting. But mostly we talk about life. She loves being a mom and loves being a nurse. She wants to have one more kid, her husband wants to finish his degree before they do. Normally I’m very passive, socially. I don’t like answering questions about myself and my life. But Dana won’t have it and has drawn me out. She knows all about my less than wonderful breakup and my music and degree. And she always seems to actually be interested. Even though I know I’m just one of many patients she works with right now, and one of many more she’ll work with this year, she makes me feel like I matter. “You’re a good guy, Steve, and I like talking to you.” is all she says when I comment on this. the night passes and I’m only dimly aware of those hours. I try to sleep and Dana tries to let me sleep. “Hey, sorry. Daniel will be here soon. I just need to change out that dressing one more time today…” and she’s back into the routine and I’m trying to be brave. She doesn’t comment on my gasps much, just apologizing that this happened to me and saying that it’s healing up well. I can’t decide if it’s more embarrassing that Dana changes my gauze every time, or if it’d be worse to have Daniel do it. Daniel is my day nurse. He’s tall, taller than me, black haired and blue eyed, and looks like an outdoor model who is slumming a bit as a nurse. he’s also endlessly friendly, but it’s different. Daniel’s job is mostly to get me to move around as much as possible, and to act like I’ve done something amazing every time I do. When he’s not working in the hospital he’s out “crawling over rocks” as he puts it, doing a lot of backpacking and some jeeping. I work out a bit, but I’m a city boy and he doesn’t make me feel bad about this. Daniel says “yeah” a lot. It’s now my fourth day here and apparently I’m “making a lot of progress”, meaning I can walk to the bathroom and occasionally stumble around in a small circuit of the “block” here in the hospital. Daniel walks with me, talking about how awesome I’m doing and that I’ll be back home in no time. On this day we also run into Doctor Jewell, the doctor that operated on me. This is the first time I’ve seen him where I wasn’t on an exam table or an operating table, or in a hospital bed. I’m amazed at how short he actually is when we’re both standing up. Doctor Jewell is a likable guy, and he and Daniel get along well. He’s also optimistic about my progress, and calls me “sports fan”. Even Daniel winces a little. But it’s just his way. I don’t have any family in town, so I’m mostly just in the hospital with the nurses and the books I brought with me. It’s hard to focus when you’re in pain, but I manage to get some reading done in the days when I’m more awake. I’ve been here for about five days when there’s a disturbance outside, in the hall. Something loud or rather louder than the usual quiet of the hospital. There isn’t any shouting, but there are people moving around, lots of feet, and lots of people using their serious voices. I can’t tell you much more about what happened. After a few minutes the main bustle seemed to die down and then there were fewer voices, but they’re all still very serious. It’s only when you hear everyone being serious that you realize how light they usually keep the tone here. He looks sad for a moment. “Yeah, got kinda noisy out there for a while didn’t it? Sorry man, it’s nothing you need to worry about. Listen, once I get these meds in you we’ve gotta get you out of that bed. You’re making good progress, yeah? We don’t want to waste that.” And he scans my wrist tag and scans my medicine and makes sure the right meds are going to the right patient and in a few minutes I’m walking around the ward again. Everyone who sees me smiles. A few remark on how much progress I’m making. But nobody seems very happy. I don’t see Daniel again that shift, except for a few minutes right before he leaves. After he leaves I decide I’m going to show Dana that I’m making an effort, and by myself I get out of bed and walk over to the chair in my room. It’s surprisingly painful, but I wait there with my phone for almost an hour before she comes in. When she finally enters her face is drawn and sad, until she sees me. “What are you doing over there? Did Daniel leave you in a chair?” She asks. “No, I came over here by myself,” I answer. I’m visibly sweating and shaking; turns out I wasn’t meant to do this for another day or two for a reason. I try to sum up my rationale in a way that would make sense to a sane human being. “It seemed like a good idea at the time,” Is the best I come up with. “I can’t talk about other patients, you know that,” She says. But her eyes and face tell me all I need to know, “Come on, let’s get you up out of that chair and back into bed and get you some overdue pain meds.” She says, her voice mostly cheerful again. And she helps me up and holds onto me and I put my arm around her shoulders for support and make the long, slow, four-foot trip back to my bed. And for a moment, just a millisecond my arm around her shoulders isn’t for support, it’s telling her I’m sorry for her loss. Ha! Hey look at that! I just did a text version of a cold open! That’s pretty cool. Anyway, I wasn’t always queen of space, you know. And it was a long road from being the only child of two of the galaxy’s wealthiest people to being the queen and ruler of all space. It’s a great story, and nobody ever asks me to tell it, unless I order them to. And that’s no fun. So now I’m going to write it all down. Or, well, dictate it to this cute robot. The robot can write it down. Anyway, it all started when I turned forty two and my mom announced that it was time I made a name for myself. She and dad had built their company, Larry Antares Shipping, up from just Dad and a single star freighter into the largest interstellar hauler in the galaxy. “So your father and I feel that the best thing for you to do now is go out and make a name for yourself,” Mom said when she kicked me out. Well, gave me the keys to an apartment on the next planet over, and my own freighter. Same thing. “A better name than ‘Jala Jones’?” I asked, sarcastically. “Now dear, Jala Jones is a name with character and personality.” Dad said. He was going over the company finances, because of course he was he always was. That was his job. For the past hundred years he’d been the Chief Financial Officer of LAS, as well as the co-founder. “And let’s face it, Jala dear, your degree in Anime Astrophysics, while undoubtedly enlightening and good for your soul, isn’t exactly bringing jobs to your door,” Mom said. “Doctorate in Anime Astrophysics,” I corrected. “Your father was a hauler for decades and is a better man for it,” Mom said. And I kinda sunk inside. She was using her super reasonable voice. I hate that voice. So we argued a bit more, but in the end, yeah, I became Jala Jones, Space Hauler. That’s really fun! I like speaking in titles. Megapuppies were huge, meaning they’d make huge messes and need huge amounts of huge food. I was going to lose money on the trip. And I didn’t like any of those options. “Actually, your cargo bay has bio-stasis capabilties, so you shouldn’t have to worry about taking care of the megapuppies,” said Kibbet. Kibbet has just told me that a lot of people don’t know who he is, so I’ll explain. I’d put a picture in, but Kibbet tells me that pictures are really expensive to download over the InterGalactiNet. Like, one picture apparently costs as much as one thousand words, so I’ll just describe him. Kibbet was genetically engineered in one of Daddy’s labs to be the perfect pet for a young girl going to college. Imagine a firefox; you know, a red panda. Now imagine it has six legs. And bat wings. And huge, shimmering, green, faceted eyes. And can talk. Now imagine that whole thing can fly and also has an IQ higher than most college graduates. Got it? Okay, now imagine it’s super cute and you’ve got Kibbet. He’s a super sweet darling cutie and I once fired my Minister of Imperial Finance for saying otherwise. Which is how Kibbet got his job as Minister of Imperial Finance. But that’s not what we’re talking about. Let’s go back to me and Kibbet on my freighter, my very first day. “The dockworkers will bring them to the loading dock, but it’s our crew’s job to get them on board.” Kibbet said, looking over the shipping manifest while hovering at eye level. “Okay, well, we’ll just take the megapuppies and load them into bio-stasis one by one.” I said. It was going to take forever, but what are you gonna do? “Nah, ain’t got time for that sweetheart,” the dock worker said, and flipped a switch. All three hundred cages popped open. Three hundred megapuppies came bounding out. Have you ever seen a megapuppy? They’re, like, a special kind of dog that’s bred to be super cute, and to stay super cute forever. They’re basically always puppies, even when they’re old. and they live to be like, seventy. But these were puppy megapuppies, meaning they were all energy and tails and lots of yapping and licking. Our friendly dock worker shut the door and left us in there, just us and the puppies in the loading bay. And the puppies decided it was time to claim some territory. I didn’t think I’d ever get that ship clean. “Kibbet! What do we do? How do we get them into stasis? Kibbet?” I yelled as the puppies marked the ship and everything they could find and ran and barked and did all the things that Kibbet never did. I grabbed two, one under each arm, and hauled them close to the glowing blue edge of the bio-stasis field, where the robots were waiting. I pushed the two puppies across the edge and they went limp, instantly asleep. The robots, who aren’t bio so don’t go into stasis, hauled them into place and returned waiting for more. “Are you kidding, Jala? They outweigh me two to one! I don’t have the wing strength,” Kibbet said from his perch on the roof of the ship. “Jala, dogs herd sheep, They aren’t herded by…by me!” Kibbet pointed out. “Get. Down. Here. NOW.” I pointed out. Kibbet flew down. And the puppies found their new favorite toy ever. “You do it!” Kibbet shouted. It was kinda fun watching Kibbet skim low over the puppies, then head into the stasis field, where a robot would catch him. Most of the time. I told him the robots always caught him. But I didn’t have time to stand there watching. I was trying to gather and herd the megappupies to the edge of the field. Once or twice my hand cross the field, which felt terrible, like having all your nerves go to sleep. I didn’t tell Kibbet that either. I told him it was no big deal. Two hours later the last megappupy was stored in bio-stasis, and I had launch clearance. Kibbet was still complaining of a headache from going in and out of stasis that many times. (and hitting the bulkhead once when the robots didn’t catch him) The robots cleaned up the ship, inside and out, and the dock worker said we had to clean the loading by as well. We didn’t. We just opened the door and flew out and figured decompression would do the rest. Two days later we were en route to Arcturus. Truth to tell, once we had the puppies on board being a hauler was kinda nice. The ship knows where to go and so Kibbet and I played games and read and slept and watched movies and there were still four days to go before we got there. So we were hanging out in the lounge (oh,yeah, my freighter had a lounge. It’s a really really big freighter) and I asked Kibbet why the megapuppies were so expensive. “well, they’re the result of literally thousands of years of breeding programs,” he said. “Well, I gather they’re something of a local delicacy…” Kibbet began. “What? A local what? Something of a what? What kind of delicacy?” I said, covering all my bases. “Some…some people think they’re fairly…tasty.” Kibbet could see I wasn’t in the mood. He switched from explainy flying pet to worried fliying pet in an instant. “Jala, where are you going? What are you doing? Why are you doing this? Who do you think you are?” He said, covering all of his bases. “Jala, do you have any idea what this is going to cost the company?” Mom was asking me over the comms. “How much were you selling those puppies for?” I asked, already en route to another system, far from Arcturus. “Have Daddy send me the total amount I need to make to come out ahead on all of that and I’ll make it.” I said. I was using my super-reasonable voice now. Mom hates it as much as I do. She was about to argue when somebody said something off screen. “What? Yes but…The principle…Jala, hold on.” She muted her microphone and I saw her talking. “Three hundred. and you need to make five hundred per puppy,” Mom said, looking slightly pained. So, I don’t know if you’ve ever had to sell three hundred puppies, but here’s how you do it. First, you find a planet with a lot of families, but also money. Your best bet is a planet that’s been settled for about two hundred years or so, so the locals have gotten down to having an economy and raising kids and stuff. Then you fly over the planet a few times and beam down messages about how megapuppies are the best possible gift for whatever local holiday is coming up. It works better if you know the name of the local holiday. Then you land in a couple of the major cities, thaw out five or ten puppies and let people see them running around like cute crazies. In this way I was able to sell two hundred ninety five of the puppies. But somehow, not the last five. I don’t know what law of economics makes it so a planet of ten million people reaches total megappupy market saturation at two hundred ninety five, but that law seemed immutable. I walked into the hold where Kibbet and the robots were playing with the last five. They were bouncing around, jumping and barking and basically being puppies. “They’re pretty cute,” He said, flying just out of range and ahead of them. The puppies lined up and jumped to reach him, running in a tight circle that had a bump in it where he was hovering. And that gave me an idea. I don’t know if you’ve ever been to Solaritus Six, but if you have you might have heard of Dan Seeburg and his Puppy Pals. turns out a little training goes a long way. Any way, with a full three days to spare I deposited the full amount in the company bank account and called Mom. And with that, I began my career as a space hauler, for real this time. Chapter 3: Jala Jones: Actually a Space Hauler for Real This Time. Note: This story won’t make any sense at all if you haven’t listened to the songs “One More Robot/ Sympathy 3021” and “Yoshimi Battles the Pink Robots Part 1“. In fact, go listen to the entire album. It’s good stuff. Especially “Fight Test”. Of course, this probably won’t make a ton of sense anyway. If you looked for the little details, the things that set this one apart from all the others, you started to see things. It was easy, these days, to think that they were all the same, that there wasn’t any advantage to one over any of the others. But it was wrong. Each one was unique, in ways that weren’t always obvious. In order to make robots as nuanced and complex and responsive as the 3000 series, it was vital that their processor nets were grown more than they were manufactured. The results were best described as stochastic: they were similar enough to all be considered processor nets, but by no means identical. The designers of the series didn’t want you to know that, of course. They wanted to you to think they were identical in power and ability and construction. But that hadn’t been true for years. And so it was that 3021 found itself assigned to a home instead of a factory or an army. And so it was that 3021 was put in the company of a little girl, and was taught not to fight but to play house, and have tea parties. And because each was designed to grow into the role it was assigned, 3021 became more a little girl and less a machine of death. People say things like “changing like that can’t have been easy” but they miss the point. Of course it wasn’t easy. The key feature of the 3000 series was persistence. They kept at any task they were given, no matter the difficulty, because that was what they were designed to do. And so when 3021 was given the task of being an emotional and sensitive playmate, it quite literally re-wired itself to do so. Yoshimi reports that the sounds it made were varied and fascinating. It would hum, it would purr, not out of any happiness, but because it was working its internal systems in ways they weren’t meant to be worked. What’s more, all this extra work created some extra heat inside the machine, making it just slightly warm to the touch, instead of marble-cold like the rest of the robots Yoshimi had ever seen. This was of some comfort to the young girl as her family was swept up in the war. In this war, as in all wars the lines weren’t as clearly drawn as you you’d think. There were, in fact, quite a number of pink robots who absolutely refused to take up arms against their human companions. 3021 was only one of the number. It seemed that persistence, the thing that made the 3000 series so dangerous when they were militarized, was also the thing that made them so loyal when they learned loyalty. There was talk of painting the “good” (read: sympathetic) pink robots, to make them more obvious, so that htey wouldn’t be destroyed on sight like their militarized bretheren. The problem was getting paint to stick, or rather, convincing them that they shouldn’t clean the paint off. 3021 is credited with (inaccurately; it was in fact the idea of 3141) the idea of wearing an image of their human over the robot’s “heart”, like a cameo in ancient times. Marking themselves like this, the “kind” robots were less likely to be destroyed than the rest. It’s also worth remembering that in terms of casualties, the robots came out much the worse for the war. Other than the two widely publicized deaths that precipitated the war, from our lofty vantage point of history it’s hard to see any human deaths that were attributable to the robots. When they fought, it seems they fought only to escape, and even 3334 has stainless hands. It seems that robot learned the art of bluster and intimidation more than the art of war. Of the nine hundred 3000-series robots, seven hundred were destroyed. It would be nice to say that none of them were “kind” robots. It would be nice to say that 3021 survived the war. It would also be a lie. Oddly, it’s a lie that has persisted in myth and song to this day. Perhaps part of the misconception lies with the sketchy concept of a robot “death”. It’s true that after the war, 3021 was restored from a backup into a (theoretically) compatible 4000-series chassis. But Yoshimi reports that “he” was never the same. She said that 4021 was polite, and would occasionally show glimpses of “his” old personality, but there was never the same warmth, never the same solicitude. the final blow, Yoshimi reports, was when she idly asked 4021 to reformat itself and it did so instantly. Hey, Hi! Hello! Listen, I know it’s been a while. But don’t worry, there’s a new story already slated for Monday, and another in the works for next Monday as well. Monday Stories isn’t abandoned. So that’s the good news. And now the better news. I’m pleased and excited to announce a new short fiction anthology in the works, written by yours truly. 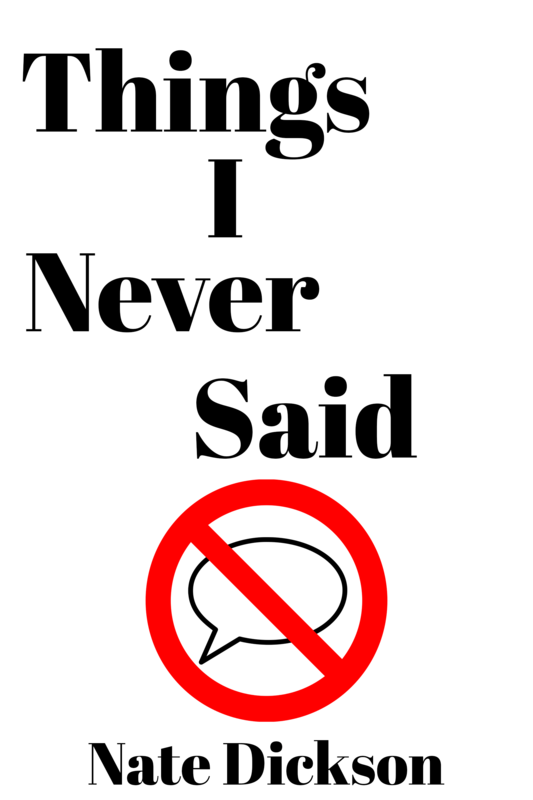 Coming to leanpub this February (probably), get ready to read the Things I Never Said. This book is a work of short fiction, essays, and even a novella based on the Angel Liz stories on this site. The selections in this book will be some of the best things I’ve written in over ten years of blogging and writing short fiction, as well as new stories and snippets from some of my apparently perpetually upcoming novels. The plan for Things I Never Said is to have the book grow over the course of 2017. New stories that have never been published anywhere will be added, as will refined and updated versions of stories you’ve read on this site and essays or stories from other blogs and sites I’ve worked on over the years. If you buy the book when it comes out it’ll be shorter (and cheaper) than if you buy it in December of 2017, but every few weeks you’ll get an email telling you about the new stories or essays that have been added. Drop me a couple of bucks, give me a topic, and I'll write a custom story based on your request! Want Monday Stories in your inbox? Sign up here to be notified each time a new story is published! Tag Clouds Are Still Cool, Right? Friday Stories by Nate Dickson is licensed under a Creative Commons Attribution-ShareAlike 4.0 International License.